Real ID is a shorthand way of referring to the Federal REAL ID Act of 2005 which was passed by Congress in 2005. The legislation establishes minimum security standards for state-issued Driver’s Licenses and ID cards that can be used for official federal purposes such as boarding a domestic flight/commercial aircraft, entering a federal building or military base and entering a nuclear facility. Q: DO I NEED A REAL ID? Yes! If you intend to use your Driver’s License or State ID Card to board a domestic flight/commercial aircraft, enter a federal building or military base or enter a nuclear facility you will need a REAL ID-compliant form of identification. Note – In some cases, you may use a valid U.S. Passport, Military ID or another federally approved form of identification. Each agency that requires identity documents such as TSA, military bases, federal buildings, etc., has defined what documents it will accept. Please inquire with those entities before visiting their facility. Q: HOW DO I KNOW IF MY NEW MEXICO DRIVER’S LICENSE OR ID IS REAL ID COMPLIANT? If you renewed or received a new Driver’s License or ID card after the State of New Mexico began issuing REAL ID-compliant forms of identification on November 14, 2016 it is likely you are REAL ID-compliant.To be sure, look for the star symbol on your New Mexico Driver’s License or ID. Q: MY NEW MEXICO DRIVER’S LICENSE ISN’T REAL ID COMPLIANT, CAN I STILL USE IT? Yes, but only until 9/30/2020. If you intend to use your Driver’s License or State ID Card to board a domestic flight/commercial aircraft, enter a federal building or military base or enter a nuclear facility you will need a REAL ID compliant form of identification before the deadline of October 1, 2020. See below for additional info on when best to obtain a REAL ID. 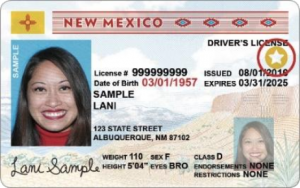 Expires BEFORE October 1, 2020 – You are eligible to renew and obtain a REAL ID when your current New Mexico Driver’s License or ID expires. Expires AFTER October 1, 2020 – You are eligible to renew and obtain a REAL ID at any time before the federal deadline of October 1, 2020. While there is no need to rush, we strongly recommend you beat the rush and renew sooner than later. Q: WHEN DO I NEED TO GET A REAL ID? IS THERE A DEADLINE? Q: WHERE DO I GET A REAL ID? All MVD Express locations are authorized to issue REAL ID Driver’s Licenses or State ID cards. For a list of locations or to make an appointment click here. Q: IS THERE A REAL ID ALTERNATIVE? Yes. The Driver Authorization Card (DAC) or non-REAL ID Identification Card can be used as a driver’s license or a valid form of identification in New Mexico but ARE NOT acceptable for federal purposes (boarding a domestic flight/commercial aircraft, entering a federal building or military base and entering a nuclear facility).Choosing between the DAC or REAL ID is dependent on an individual’s needs. If you are a frequent air traveler, it is strongly recommended you choose a REAL ID. If you simply need your license to legally operate your vehicle and need it ASAP, you may be best served by getting a DAC (and getting a Real ID-compliant license later). Q: WHAT IS A DRIVER AUTHORIZATION CARD (DAC)? A Driver Authorization Card (DAC) is what we are now calling New Mexico driver’s licenses that do not comply with Real ID requirements. It is simply a change in terms to help us and our customers distinguish between the two types (REAL ID vs. non-REAL ID) of driver’s licenses and state IDs that may be issued. Q: IS IT EASIER TO GET A DAC RATHER THAN A REAL ID? Sort of… Rather than providing (1) Proof of Identification Number (SSN Card, W2, SSA-1099) and (1) Proof Identity & Age (birth certificate, passport, certificate of citizenship etc. ), you just need to provide (1) document showing Identity and Date of Birth. If you are unable to show Identity and Date of Birth in one document, (2) documents will be required. As with REAL ID, (2) Proofs of New Mexico Residency is required to obtain a DAC. Please note – If you are unable to provide documentation of lawful status and your New Mexico Driver’s License has expired, you will be required to provide fingerprints with the State. Remember, the Driver Authorization Card (DAC) or non-REAL ID Identification Card can be used as a driver’s license or a valid form of identification in New Mexico and ARE NOT acceptable for federal purposes (boarding a domestic flight/commercial aircraft, entering a federal building or military base and entering a nuclear facility) beginning October 2020. Q: WHAT DOCUMENTS ARE REQUIRED FOR THE DAC? In addition to (2) Proofs of Residency you will need to provide (1) Proof of Identity & Date of Birth. If the document does not contain the applicant’s name and date of birth (2) of the below documents will be required. Please note, all documents must reflect your current legal name*. Click here to view the full list of acceptable documents for a Driver Authorization Card. Note: Documents must be original or certified copies. Paperless Billing Statement Copies are acceptable. Photocopies, notarized photocopies and non-certified copies are NOT acceptable. *The name on all your documents must be the same. If you use a name other than the legal name on your identity document (such as birth certificate or passport), you must provide proof of each name change. If the name you currently use is not what’s on your identity document, you may have to change your name legally or, if you are eligible, apply for an amended birth certificate. You will need a marriage certificate or divorce decree if you have been married or divorced and changed your name from your name at birth. If you are uncertain, bring your identity documents and the documents showing your name change to your local MVD Express or give us a call at 505-226-9333. Q: WHAT DOCUMENTS ARE REQUIRED TO GET A REAL ID? To obtain a New Mexico REAL ID you will need (1) Proof of Identification Number, (1) Proof of Identity & Age and (2) Proofs of Residency. Please note, all documents must reflect your current legal name*. See below for the most common documents used to obtain a REAL ID Driver’s License or ID: Click here to view the full list of REAL ID acceptable documents. Q: WHAT IS A LAWFUL NAME? A Lawful/legal name is the name that a person uses for official purposes. The name on your New Mexico Driver’s License or ID must be your legal name. Original Legal Name – A person’s original legal name is usually the name that appears on a birth certificate. A person’s original legal name may be changed through marriage, divorce, adoption or a legal name change. Current Legal Name – When your original name is legally changed it becomes your current legal name. Q: WHAT IF MY NAME HAS CHANGED? Note – The name on all your documents must be the same. If you use a name other than the legal name on your identity document (such as birth certificate or passport), you must provide proof of each name change. If the name you currently use is not what’s on your identity document, you may have to change your name legally or, if you are eligible, apply for an amended birth certificate. Q: WHEN WOULD I NEED AN AMENDED BIRTH CERTIFICATE? If the name listed on your birth certificate is misspelled, out-of-order (Jane Mary Doe vs. Mary Jane Doe) or a different version (Jose vs. Joe) you may need an amended birth certificate. You can apply for a name correction with the Office of Vital Records from the State or Tribe in which you were born or registered. Q: WHAT DO I NEED TO GET A LEGAL NAME CHANGE THROUGH THE COURTS? Susan Lucile Goldstein signed her marriage certificate Susie L. Goldstein when she married Stephen Romero. Now she wants to be called Susie L. Romero or some other variation of Susan Lucile Romero. Q: WHAT IF MY IDENTIFICATION NUMBER OR NM RESIDENCY DOCUMENTS DO NOT MATCH MY CURRENT LEGAL NAME? When your current lawful/legal name does not match your documents, follow the below guidelines to make corrections to your Identification Number or New Mexico Residency Documents. Note: In the case of any individual who uses a suffix, i.e. Jr., the suffix will be used on the REAL ID to resolve situations where the identity and identity number of the applicant is in question. The suffix must match Identification Number and New Mexico Residency documents. Q: I’M HAVING A HARD TIME LOCATING AND/OR COLLECTING ALL THE NECESSARY DOCUMENTS FOR REAL ID. ANY TIPS? We know that collecting all the necessary documents to obtain a REAL ID can be challenging, but we’re here to make REAL ID easy. MVD Express has a dedicated call center with REAL ID experts available to answer any of your questions and will help verify your documents will be accepted.